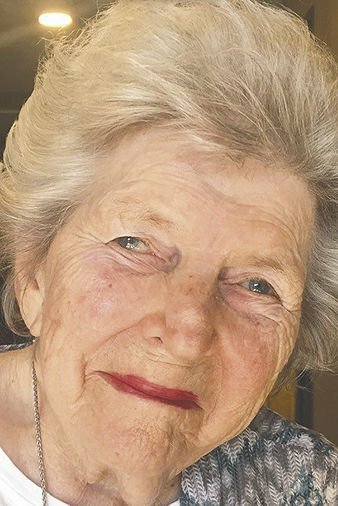 Helen Engeborg Nielsen passed away peacefully at the Care Center at Atterdag Village on March 27, 2019, surrounded by her loving family and the staff that cared for her for the past six years. She leaves behind her devastated children Sharon Price, Dan Nielsen (Terry) and Linda Johansen (Dan). Her beloved grandchildren and great grandchildren will miss her beyond words; Cheryl O'Brien (John), Deanna Price, Dusty Keegan (Conor), Nick Nielsen, and Erik and Adam Johansen. Her great grandchildren Chase Bergasse, Jordyn Leon, Savannah Negrete, Ailish Keegan and all of the friends of those mentioned above who were lucky enough to call her Grammie too, and know the depths of her love and generosity, will also miss and cherish her always. She is also survived by her brother Gene Rasmussen (Linda) and many nieces, nephews and god children. Preceding her in death was her husband Daryl Nielsen, and 5 year old son, Dear John as he was called by everyone, parents Harvey Rasmussen and Karen Christensen, brother Ken Rasmussen and sister Darlene Saulsbury and her beloved Dalmatian dog Laddie. Helen was born October 2, 1922 in Solvang and attended the S.Y. High School and married her high school sweetheart, Daryl Andrew Nielsen. They were married in Washington D.C. on November 2, 1942 and they remained married for 67 years until his passing in 2008. They lived in Ogden, Utah, where Daryl was stationed as an Army Captain responsible for the supply depot. Sharon and Dan were both born in Ogden Utah, and after moving back to Solvang for Daryl to help run the family lumber business, Linda and John were born. They were both born in Santa Barbara as there was no hospital in Solvang at that time. Helen was very involved in the community and with her children. She was a Cub Scout and Boy Scout Leader, a Girl Scout and 4H Leader and the President of the local Red Cross Chapter earning a 50 year pin and then serving almost 10 more years. She organized the local Blood Drives and was involved in the Danish Sisterhood and Brotherhood as well as the American Legion cooking monthly dinners all by herself for all the members and always helping with Veterans Day and putting all the crosses at the cemeteries. She was a charter member of the S.Y. Hospital Auxiliary and a member of the Atterdag Auxiliary. She always volunteered and was very active in our local Danish Days celebration. Helen was also involved in every aspect of her children's school activities and sports in Grammar School and High School and missed very few activities and sporting events for her family. She was the owner of Viking Travel Service for almost 40 years and loved to travel. She traveled the world extensively and fished in many prized destinations and she especially loved escorting group trips to various countries for all of her friends. Helen was a great golfer and basketball player, dominating all the men when they played HORSE on our court. She loved to play cards with her women's group over the years, especially inochle, and also enjoyed the widow's group dinners for many years. She loved to dance and said her brother-in-law Alton Nielsen was her favorite dance partner. She also loved working in her garden and hot house. She was kind, compassionate, giving of her time and resources, and a wonderful example to her beloved family which she cherished. Her favorite roles were Mom, Grammie and Cook and she relished all holidays and dinners where everyone was included and invited and she made everything from scratch perfectly. We are happy knowing she is at peace and with Poppie, Dear John, sister Tootie, and other family and friends that she loved so much. Her memory will be cherished by all of us and she will never be forgotten for the gentle soul she was, and how she had the uncanny ability to make us all feel so loved and special. There will be a private family burial, with church services open to the public on April 15, 10:30AM at the Solvang Bethania Lutheran Church. Donations in her name can be made to her favorite non profits: Atterdag Village of Solvang, Bethania Lutheran Church, Elverhoj Museum and Visiting Nurses.